Until the first part of the eighth century, the Thursdays of Lent were “aliturgical” days in the Roman Rite, days on which no ferial Mass was celebrated. A similar custom prevails to this day in the Ambrosian and Byzantine Rites, the former abstaining from the Eucharistic Sacrifice on all the Fridays in Lent, the latter on all the weekdays. I have described in another article why Pope St Gregory II (715-31) changed this custom, and instituted Masses for the six Thursdays between Ash Wednesday and Holy Week. The Epistle and Gospel for the Thursday in the fourth week of Lent were clearly chosen as a prelude to those of the following day, which are a much older part of the lectionary tradition. In the Epistle of both days, one of the prophets raises not just a man, but a son, at the behest of his mother, anticipating the Resurrection of the Son of God; on Thursday, Elisha raises the Sunamite’s son (4 Kings 4, 25-38), and on Friday Elijah raises the dead son of the widow of Sarephta (3 Kings 17, 17-24). Likewise, on Thursday, Christ raises the widow of Naim’s son (Luke 7, 11-16) as he is borne out to burial, and on Friday, Lazarus, on the fourth day after his death (John 11, 1-45). When St Paul spoke at the Areopagus in Athens (Acts 17, 19-34), many of the pagan philosophers who had gathered to hear him scoffed at the mention of the resurrection of the dead. The Church Fathers bear witness to the repulsion which many pagans felt at the Christian belief that the body might share the immortality which they saw as proper only to the soul, and many early heresies rejected both the Incarnation and the resurrection of the flesh professed in the Creed. On the day when the Raising of Lazarus is read, therefore, the Lenten station is kept at the church of St Eusebius on the Esquiline hill, which stood very close to a large and very ancient necropolis, a “city of the dead”, one which dated back even before the founding of Rome itself. In this way, the Church, led by the bishop of Rome, proclaimed to the ancient pagan world Her belief in the resurrection of the body, made possible by the death and resurrection of the Savior. The series is also interrupted on five days when particularly important passages of the Gospels are read, and the Communion is taken from them instead, the last such being the Raising of Lazarus. Communio Videns Dominus flentes sorores Lazari ad monumentum, lacrimatus est coram Judaeis, et exclamavit: Lazare, veni foras: et prodiit ligatis manibus et pedibus, qui fuerat quatriduanus mortuus. Seeing the sisters of Lazarus weeping at the tomb, the Lord wept before the Jews, and cried out: Lazarus, come forth: and he who had been dead four days came forth, bound by his hands and feet. The Roman Mass of the day makes no other reference to the Gospel; in this sense, the Ambrosian Rite gives Lazarus much greater prominence. The second to sixth Sundays are each named for their Gospels, all taken from St John: the Samaritan Woman (4, 5-42), Abraham (8, 31-59), the Blind Man (9, 1-38), Lazarus (11, 1-45), and Palm Sunday (11,55 - 12,11). On the Fifth Sunday, four of the seven Mass chants cite the day’s Gospel, and the Preface speaks at length about the Raising of Lazarus. The Ingressa (Introit) of the Mass is similar to the Roman Communion cited above. Ingressa Videns Dominus sororem Lazari ad monumentum, lacrimatus coram Judaeis, et exclamavit: Lazare, veni foras. Et prodiit ligatis manibus et pedibus, stetit ante eum, qui fuerat quatriduanus mortuus. Seeing the sister of Lazarus at the tomb, the Lord wept before the Jews, and cried out: Lazarus, come forth: and he who had been dead four days, coming forth, stood before him, bound by his hands and feet. The Crossing of the Red Sea, depicted in a paleo-Christian sarcophagus, a reasonably common motif in early Christian funerary art. The front of the sarcophagus has been sawed off and used as the front of an altar in the Cathedral of Arles in France. The Ambrosian Rite uses this passage not at the Easter vigil, but as an introduction to the story of Lazarus, whose death and resurrection foretell those of Christ Himself, and in Him, our own; first spiritually in the waters of baptism, and second in the body, at the end of the world. The chant which follows the first reading is called the Psalmellus; as the name suggests, it is almost always taken from one of the Psalms, like its Roman equivalent, the Gradual. Here we might expect that it be taken from the canticle of Moses in chapter 15, which follows the same passage at the Easter Vigil of the Roman and Byzantine Rites; instead, it is taken from the Gospel. Psalmellus Occurrerunt Maria et Martha ad Jesum, dicentes: Domine, Domine, si fuisses hic, Lazarus non esset mortuus. Respondit Jesus: Martha, si credideris, videbis gloriam Dei. V. Videns Jesus turbam flentem, infremuit spiritu, lacrimatus; et veniens ad locum, clamavit voce magna: Lazare veni foras. Et revixit qui erat mortuus, et vidit gloriam Dei. Mary and Martha came to meet Jesus, saying: Lord, Lord, if Thou had been here, Lazarus would not have died. Jesus answered: Martha, if thou shalt believe, thou shalt see the glory of God. V. Seeing the crowd weeping, Jesus groaned in spirit, weeping, and coming to the place, He cried out in a loud voice: Lazarus, come forth. And he that had died came back to life, and saw the glory of God. Praefatio O quam magnum et salutare mysterium, quod per resurrectionem Lazari figuraliter designatur! Ille tabo corporis dissolutus, per superni regis imperium continuo surrexit ad vitam. Nos quidem primi hominis facinore consepultos, divina Christi gratia ex inferis liberavit, et redivivos gaudiis reddidit sempiternis. O how great and profitable to salvation is this mystery, which is represented in a figure through the resurrection of Lazarus! He, being loosed from the corruption of the body, by the command of the Almighty King rose at once to life. Christ’s divine grace delivered us from hell, who indeed were buried by the crime of the first man, and restored us to eternal joy, when we had returned to life. The preface of the Fifth Sunday of Lent, sung during the Capitular Mass at the Basilica of St Ambrose in Milan in 2012. The part of the preface which I have cited above begins at 1:23. 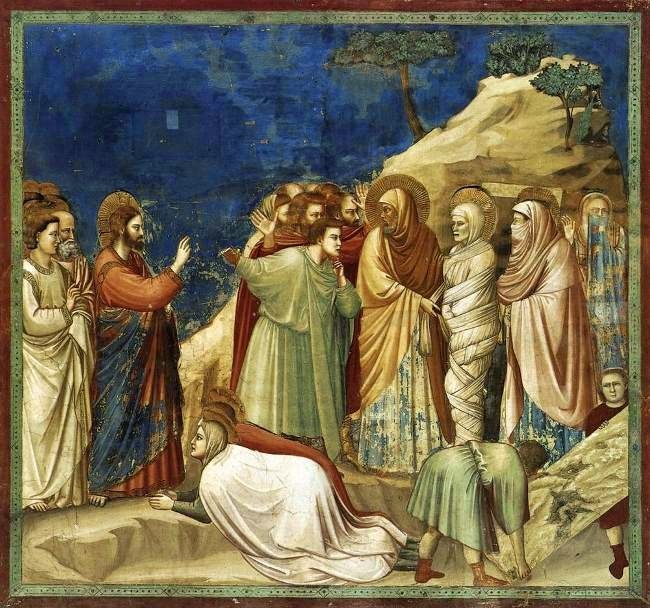 In the Byzantine Rite, the connection is made even more explicit; the Gospel of the Raising of Lazarus is read on the day before Palm Sunday, which is therefore called Lazarus Saturday. Bright vestments are used at the Divine Liturgy, instead of the dark vestments used at most services of Lent and Holy Week. The troparion sung at the Little Entrance declares the meaning of the Raising of Lazarus, and is also sung the following day, which is one of the Twelve Great feasts of the Byzantine liturgical year. Troparion Την κοινην Ἀνάστασιν προ τοῦ σοῦ Πάθους πιστούμενος, ἐκ νεκρῶν ἤγειρας τον Λάζαρον, Χριστε ὁ Θεός, ὅθεν και ἡμεῖς ὡς οἱ Παῖδες, τα τῆς νίκης σύμβολα φέροντες, σοι τῷ Νικητῇ τοῦ θανάτου βοῶμεν. Ὡσαννα ἐν τοῖς ὑψίστοις, εὐλογημένος ὁ ἐρχόμενος ἐν ὀνόματι Κυρίου! Confirming the general resurrection before Thy passion, Thou didst raise Lazarus from the dead, O Christ God! Whence we also, like the children, bearing the symbols of victory, cry out to Thee, the Vanquisher of death: Hosanna in the highest! Blessed is he that cometh in the name of the Lord! The troparion of Lazarus Saturday sung in variety of languages; see original post on Youtube for the list, and the text of the troparion in several of them. The Paschal character of the day expressed by the use of bright vestments also informs the kontakion which follows the troparion. Kontakion Ἡ πάντων χαρά, Χριστός, ἡ ἀλήθεια, το φῶς, ἡ ζωή, τοῦ κόσμου ἡ ἀνάστασις, τοῖς ἐν γῇ πεφανέρωται τῇ αὐτοῦ ἀγαθότητι, καὶ γέγονε τύπος τῆς ἀναστάσεως, τοῖς πᾶσι παρέχων θείαν ἄφεσιν. The joy of all, Christ, the Truth, and the Light, the Life, the Resurrection of the world, has appeared in His goodness to those on earth. He has become the image of our Resurrection, granting divine forgiveness to all. While the troparia and kontakia are sung by the choir, the priest silently reads a prayer called the Prayer of the Trisagion, but sings the doxology out loud. It is followed at once by the hymn “Holy God, Holy mighty one, holy immortal one, have mercy on us.” On a very small number of days, however, the Trisagion, as it is called, is replaced by another chant, the words of Galatians 3, 27, “As many of you as have been baptized in Christ, have put on Christ, alleluia.” Among these days are certain feasts of Lord such as Christmas, Epiphany (i.e. the Baptism of the Lord), Easter and Pentecost, and also Lazarus Saturday. As the Church prepares to accompany the Savior to His passion and death, and celebrate His glorious Resurrection, the Orthros (Matins) of Lazarus Saturday declares in several texts of surpassing beauty our salvation in Christ, who in His humanity wept for the death of Lazarus, the death He himself would shortly suffer, and in His divinity raised both Lazarus and Himself, as he will raise the whole of our fallen race on the last day. Knowing beforehand all thing as their Maker, in Bethany didst Thou foretell to Thy disciples, ‘Our friend Lazarus has fallen asleep today’; and knowing, Thou asked, ‘Where have ye laid him?” And to the Father Thou prayed, weeping as a man; whence also crying out, Thou raised from Hades Lazarus, whom Thou loved, on the fourth day. Therefore we cry to Thee: Accept, Christ and God, the praise of those that make bold to bring it, and deem all worthy of Thy glory. Providing to Thy disciples the proofs of Thy divinity, among the crowds Thou didst humble Thyself, taking counsel to hide It; wherefore, as one that knoweth beforehand and as God, to Thy disciples Thou foretold the death of Lazarus. And in Bethany, among the peoples, perceiving not the grave of Thy friend, as a man Thou asked to learn of it. But he that through Thee rose on the fourth day made manifest Thy divine power; Almighty Lord, glory to Thee!